[a] fluent, frequently hilarious, ultimately persuasive attempt to wring enlightenment from old Rolling Stone interviews, unauthorized biographies and video music awards clips. What compensates for his planned obsolescence is his deep knowledge of music and music-journalism history. He’s as entertaining on Eric Clapton vs. Jimi Hendrix as he is on Taylor Swift vs. Kanye West ... Hyden’s book chucks chronology and embraces digression and is all the stronger for it. He’s no less authoritative (or fun) when riffing on the feuds that predated his own lifetime than he is when surveying the ones he lived through as an actual high schooler ... Even before the heartbreaking news of Prince’s sudden death, Hyden’s chapter examining his competition with Michael Jackson in the mid-1980s stood out as among the book’s most nimble and heartfelt ... his impulse to interrogate the preferences we declare so stridently, coupled with the wisdom of 25 years of obsessing about music, is what makes Hyden a critic worth reading. 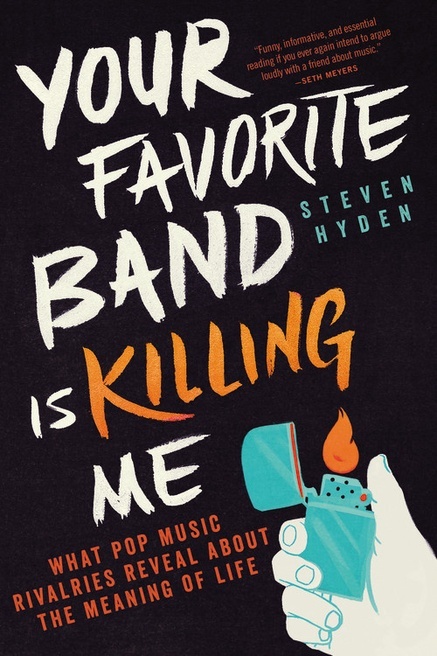 Beyond the often hilarious, sometimes heartbreaking circumstances behind these feuds, though, Your Favorite Band Is Killing Me is really about the allure of our obsessive duality ... Every chapter swings for the fences, especially since Hyden makes clear that he is setting out to challenge any conventional wisdom or unquestioned paradigms. As a result, when he misses, he misses big ... Mostly, though, Your Favorite Band Is Killing Me connects the dots on music history in new and intriguing ways. Hyden reminds us why we invest so much in these competitions, how they help shape identity for so many of us, while never losing sight of how silly they can be. Before Hyden is finished, the wildly entertaining and adamant former rock critic for Grantland considers, among others, Oasis vs. Blur, Nirvana vs. Pearl Jam, White Stripes vs. Black Keys, Taylor Swift vs. Kanye West, Eric Clapton vs. Jimi Hendrix, Roger Waters vs. the rest of Pink Floyd, Biggie vs. Tupac, Neil Young vs. Lynyrd Skynyrd and, yes of course, the Beatles vs. the Stones ... No matter who you might be on any rock-aware cultural spectrum, this is great fun. But it’s a bit more than just that, too. What did you think of Your Favorite Band Is Killing Me?